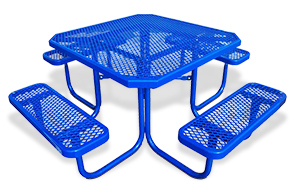 Make a mark and reinvent spaces with a 46" steel octagon picnic table. Standard, ADA compliant and game table models available to promote fun, activities and accessibility to all individuals. A convenient walk through bench design ensures easy user access to move in, out and around the picnic table seamlessly. Constructed with durable 3/4" #9 expanded steel to create an open, low maintenance diamond pattern design that is great for outdoor environments. The subtle yet distinctive octagon table shape features four attached rectangular benches supported by a 14-gauge 1-5/8" steel tube frame. A popular thermoplastic coated finish allows this steel diamond pattern octagon table to be a popular choice in providing reliable and durable seating.